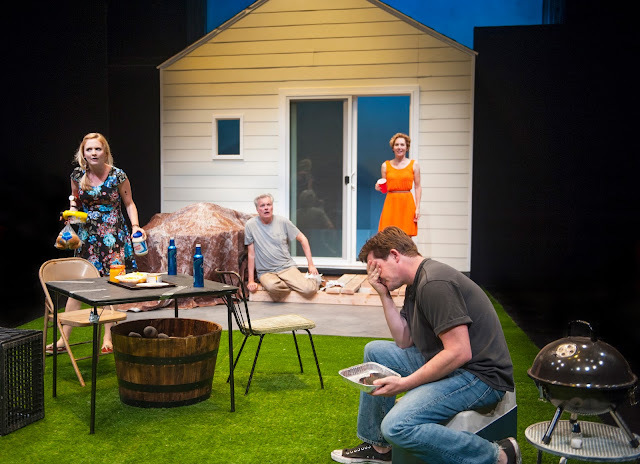 Since 2009, critics and theater-goers have been heaping praise upon "Detroit," Lisa D'Amour's Obie-Winning show of that year, when it was selected Best New American Play. Written in the midst of a financial meltdown, issues of economic dislocation and the disappearance of traditional American middle-class life are in the background at all times. 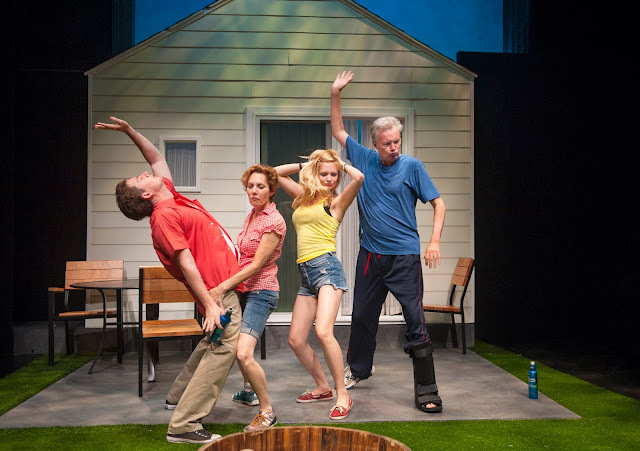 and Amy Resnick) appear to have a normal suburban life with a house and a yard and lawn furniture. 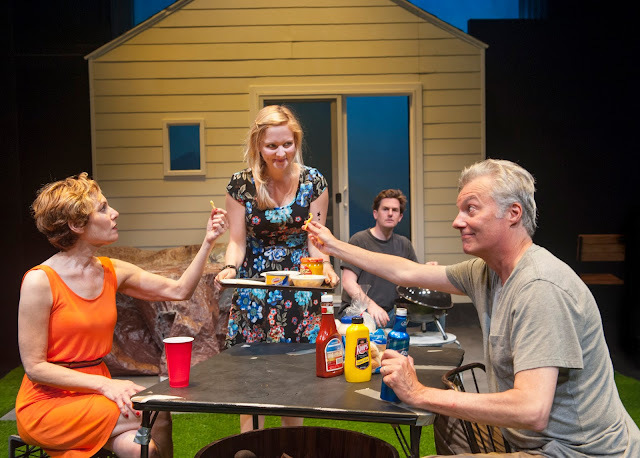 They have invited their newly-met neighbors, Kenny and Sharon (Patrick Kelly Jones and Luisa Frasconi), to a backyard barbecue. Conversation reveals that Kenny and Sharon have only recently met in a rehab facility and are practically destitute. At the same time, Ben has lost his job as a bank officer and Mary is trying to hold the house together while ignoring her own serious alcohol problem. Times are tough. Of the four, we are most drawn to Sharon, who is an emotional wreck but easy to identify with. Her vivid stream-of-consciousness monologues about drug dependency ("when I wake up in the morning, the only thing I think about is how much I want my pipe") show us how desperate is her situation. Her female counterpoint Mary is mostly played for jokes by Amy Resnick, while Mary's husband Ben is a bit over-the-top in his bemused reaction to the circus unfolding in front of him. The younger Kenny is clearly a no-goodnik and gets worse as the play chugs forward. As a result, Sharon is the one character of the four about whom we care enough to invest any emotional energy, and her fate is inconsequential to the story's resolution. As for the ending, the reviewer's wife feels there is hope for redemption implied. However you may take it, "Detroit," which is called "Funny as Hell" on the program cover, is decidedly disturbing. 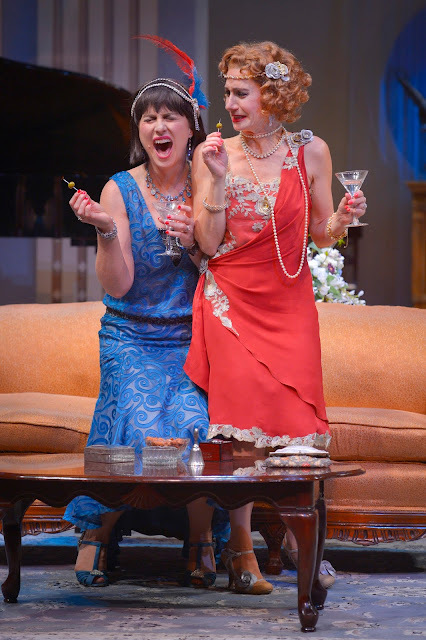 The San Francisco Theater Blog Awards Division awards "Detroit" Two Stars, one each for Luisa Frasconi's evocative performance and for Cliff Carruthers's original musical cues during the lengthy scene changes. Although somewhat long (100 minutes) for a show with no intermission, the show never lags. We are happy the women make it home from the camping trip. Or so it seems at the time. 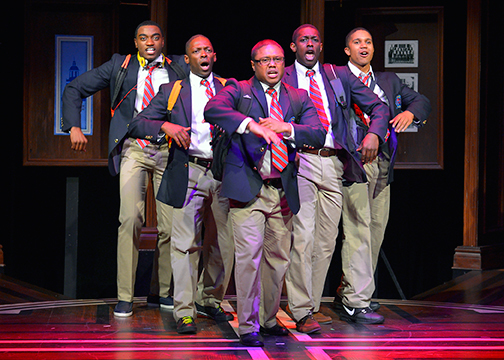 There are two ways to discuss Tarell Alvin McCraney's "Choir Boy," having its West Coast premiere at Marin Theater Company: as a play and as social commentary. 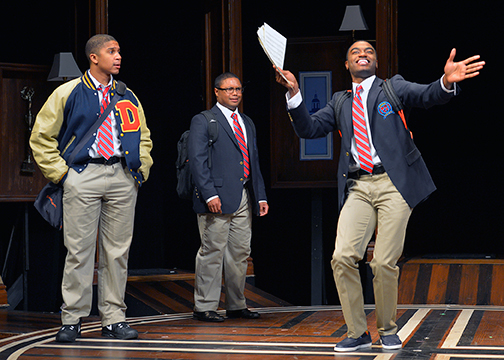 As far as the latter goes, McCraney's coming-of-age drama touches upon homophobia, racism, elitism and boarding schools versus their boards of governors, as well as generational attitudes about young black men. Mixed with some brilliant gospel singing, these issues grab our attention and hold onto it. But despite the promise of a brilliantly musical beginning, "Choir Boy" takes us to the sky but not quite to Heaven. If it is memoir, we need more background. If it is a musical, give us more variety. But if it is drama-with-music, it seems out of character for Headmaster Marrow (Ken Robinson) to turn to face the audience and sing like the opening of Oklahoma. Perhaps if the music weren't as brilliantly in the pocket when the young men are singing in their choir we would not notice the few false notes. 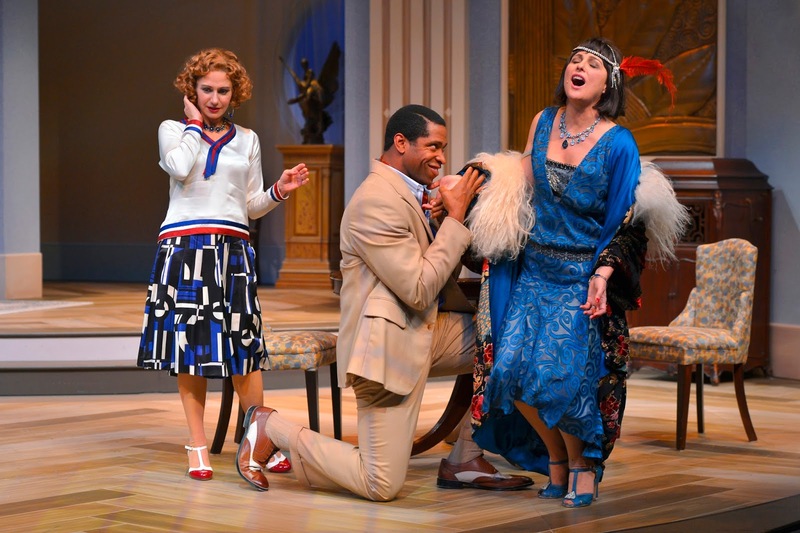 The story belongs to Pharus (Jelani Alladin), who is enthusiastically nelly -- a diva in an environment where expressing oneself in this manner can prove dangerous. He doesn't seem to notice his own arrogance, ignoring his room-mate Anthony (Jaysen Wright)'s warnings. What matters to Pharus is becoming head of the choir, and being granted the privilege of singing the school song at the upcoming graduation ceremony. 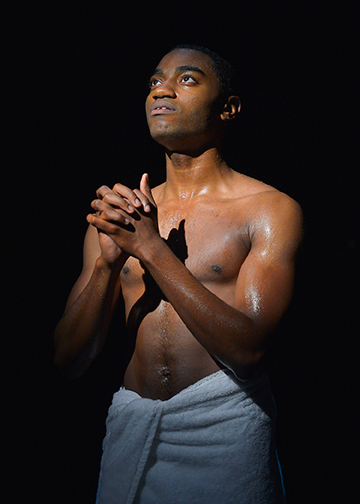 speaks hatefully to Pharus; Bobby's sidekick Junior (Rotimi Agbabiaka) sticks with Bobby, though he seems to be primarily looking out for himself. David (Forest Van Dyke) has the nicest voice but has a secret of his own that puts him in jeopardy. The character of Mr. Pendleton (Charles Shaw Robinson) is a bit confusing -- why would this man who knows nothing about music be put in charge of the choir? The set by Jason Sherwood is terrific and scene changes are skillfully executed, one minute the Headmaster's cushy office and the next a shower room, with little interruption in the action. A lot of credit also goes to Kurt Landisman for his expertly placed lighting. 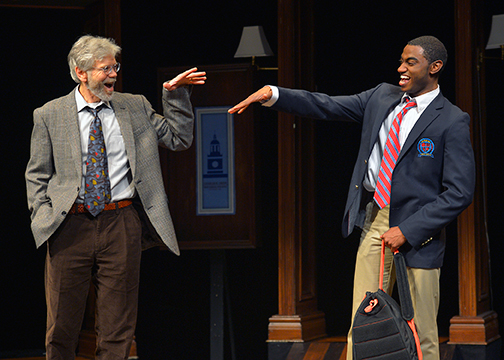 The show is directed by Kent Gash, who helmed the show in Washington D.C. 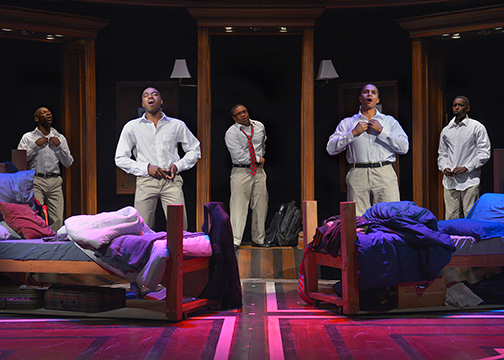 The San Francisco Theater Blog Awards Division grants "Choir Boy" Three Stars, one each for acting, directing and music. 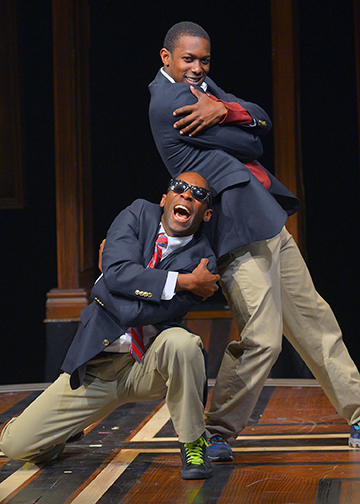 Though we have quibbles with the script, the young men on stage are all excellent performers with a lot to say. Most of "Delano" takes place within the walls of the Apostolic Gospel Church of Delano. The Magic has installed red pews in place of the side rows and several actors appear first as parishioners testifying from the theater audience. Playwright Luis Alfaro grew up both Catholic and Pentecostal and has a keen ear for the searchings and struggles of immigrants living in farm communities in California's Central Valley. 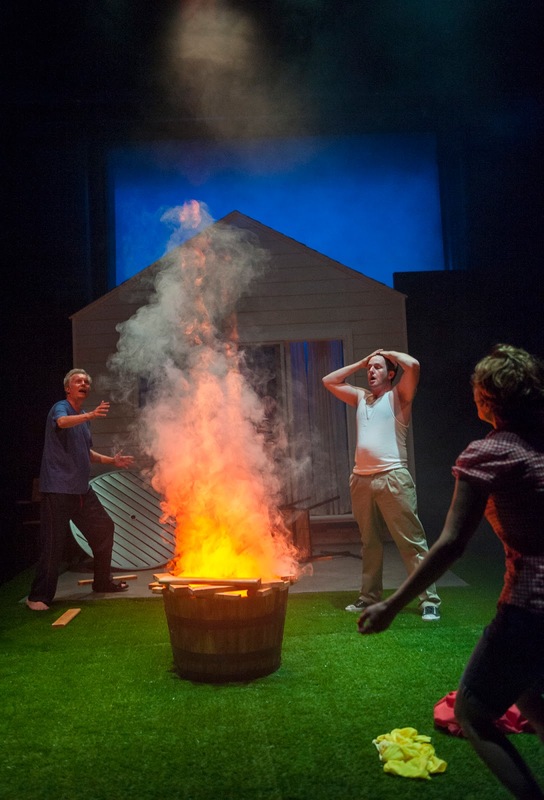 Commissioned through a partnership between the Magic Theatre and Oregon Shakespeare Companies, Part One of "This Golden State" is still a work in progress, with the author making frequent changes throughout this short run. At its strongest, we meet developed characters who are working themselves through a questioning of faith. This includes Sean San José as Elias, the returned homeboy now a pastor of his own church; Rod Gnapp as Brother Abel, the hardboiled, older church administrator; Sarah Nina Hayon as Elias's wife Esther, an outsider since she is only half-Mexican and who has questions of her own; and Wilma Bonet as Hermana Cantú, the pragmatic widow of the original spiritual leader of the church. There doesn't seem to be much point yet to Armando Rodríguez's role as Moises, while Carla Gallardo's Romie has an ending telescoped far in advance. Of course, 'Delano' will change and grow through the years that follow, as Alfaro works through and completes his trilogy -- this is an exciting venture we are sure to be discussing at great length in the future. 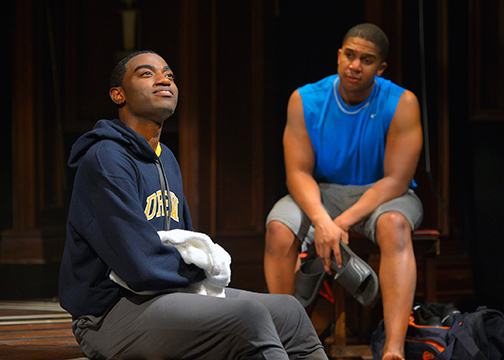 Right now, Part One: Delano is at times poignant and always laced with dark humor. In a time of drought, every character is thirsty for those answers that are so hard to find. 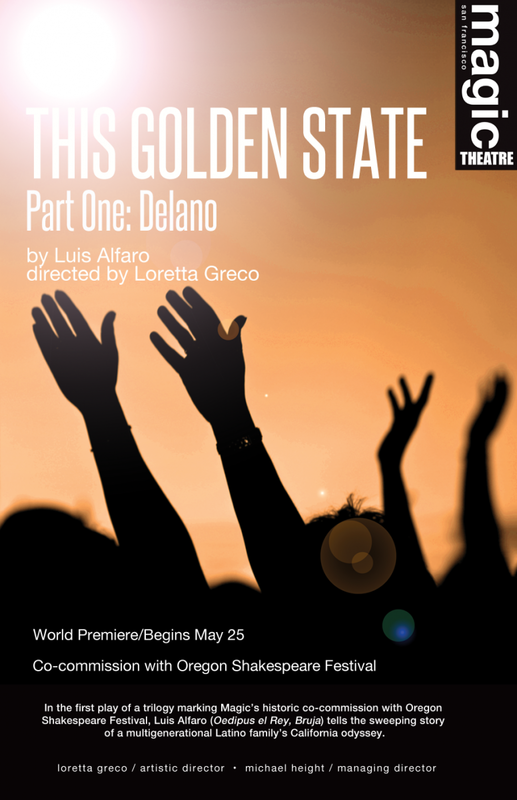 The San Francisco Theater Blog Awards Division awards "This Golden State, Part One: Delano" Three Stars. It is not on a par with "Bruja" or "Oedipus, El Rey," two Alfaro works recently premiered at the Magic, but this is only the beginning of an ambitious project. 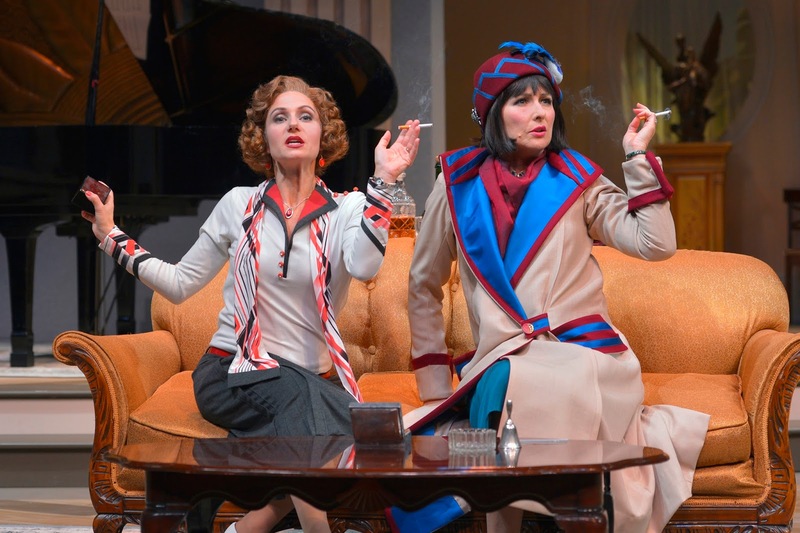 Maybe you say to yourself, "Another Noel Coward show? More English aristocrats flopping around on sofas?" No, no, no, no, no. 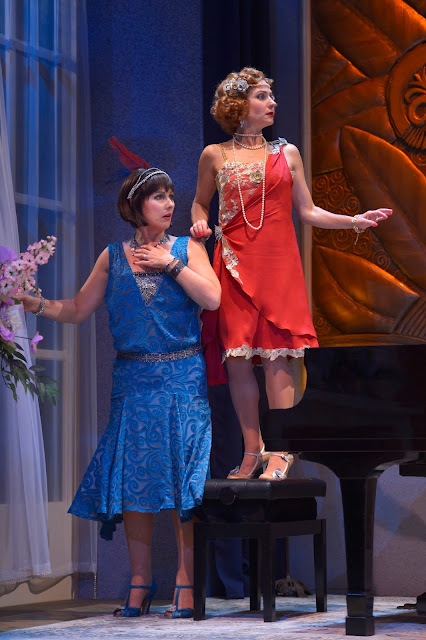 The new TheatreWorks production of "Fallen Angels," written when Coward was only 24 years old (in 1923), is a riot from start to finish, with superb performances, requisite Coward cleverness and an entire act where Jane (Rebecca Dines, in blue) and Julia (Sarah Overman, in red) get gloriously plastered. 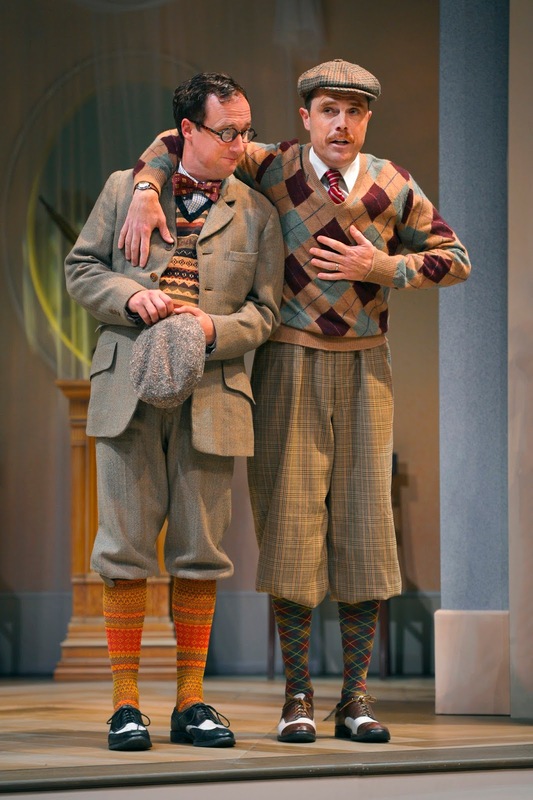 Jane's husband Willy (Cassidy Brown) and Julia's husband Fred (Mark Anderson Phillips) have no idea what is going on. To them, it's still yesterday, when men have their golf and women drink their tea. Little do they know the passion their wives still hold in their hearts for the ex-boyfriend of both women, Maurice (Aldo Billingslea). And Maurice just happens to be in town. The beauty of Fallen Angels is the understanding the two women have of the difficult situation they are in. Above all, they are best friends, and wish to remain always so; on the other hand, they realize they will claw each other to bits for Maurice's affections. Or so they say. The long second act, distilled from the original and even longer second and third acts, flies by at the speed of champagne as the women wait for Maurice to show up. He does not, so they get drunker and drunker, helped along by Julia's extraordinary new maid Saunders (Tory Ross). Saunders serves tea, plays piano, concocts hangover cures and is the source of much un-asked-for advice. Dines and Overman could not be more perfect. You will not want to miss this show if only to see the two of them worry about whether a tree might have killed Fred and Willy. For that would be horrible, wouldn't it? Wouldn't it? 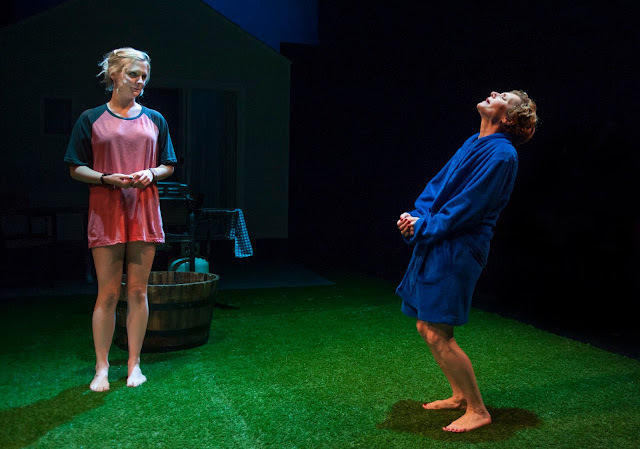 The San Francisco Theater Blog Awards Division can do bloody nothing else but award "Fallen Angels" Four Stars with a BANGLE OF PRAISE. 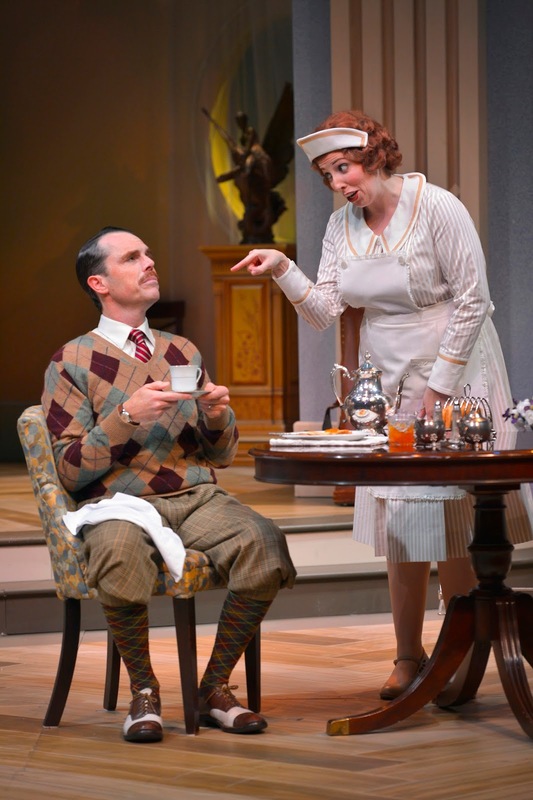 Acting, Direction by Robert Kelley, Costumes by Fumiko Bielefeldt and the lavishly lovely set by J.B. Wilson all earn one star each. And let us add a BANGLE OF PRAISE for Noel Coward's "Lovely Song," which will ear-worm itself into your brain and not let go. You have been warned.